Here's another reason to go to the New York Public Library. This time, head to the 42nd Street Library, the one that's between the Lions on 5th Avenue, also known as the The New York Public Library's Humanities and Social Sciences Library. 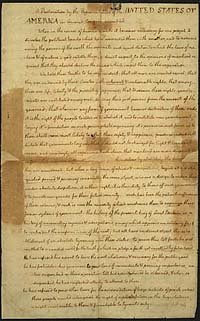 The NYPL's "fair copy of the Declaration of Independence in Thomas Jefferson's hand will be the centerpiece of a display that will include several other landmark versions of the document and early newspaper printings, as well as an autograph letter from Benjamin Franklin to George Washington." This Independence Day Celebration by the NYPL is on from June 25 through July 31 (closed July 3 through July 5).